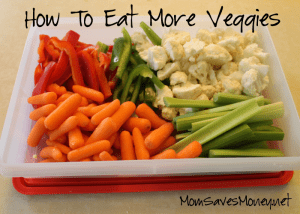 Meal Ideas for This Week’s Sale Items & Tips to Eat More Veggies! It’s Beef time in OMAHA! A couple of different places have hamburger on sale at a great price. Time to stock up! Check out the rest of this week’s deals. Hamburgers – It’s Memorial Day weekend! Chances are pretty good that grillin’ is on the menu for lots of families. Grill up some burgers! Philly Cheese Steak Sloppy Joes – Since you’re already buying buns for hamburgers, pick some up for this awesome looking recipe! Grilled Pork Chops – Growing up, I was never a fan of pork chops, but I went looking for a good recipe since I found some chops on sale. HOLY BUCKETS! I am a fan! Simple marinade. Then just grilled for about 5 minutes on each side and it was so tender. So tasty. Must.Make.Again. Tex Mex Chicken Casserole – If I wasn’t already married to the man, I think my husband would’ve proposed again after I made this last week. It was THAT good. I think he liked the level of spice in it, so if you like things less spicy, use a mild Rotel or just regular diced tomatoes. Slow Cooker BBQ Drumsticks – Don’t want to heat up your house with the oven? Don’t blame ya! Get the slow cooker out! Barbeque sauce is on sale too! I don’t really have a recipe for you today – just a tip! Lately, I’ve been trying to eat more vegetables. Especially because they’re starting to be in season, and thus, cheaper to buy. 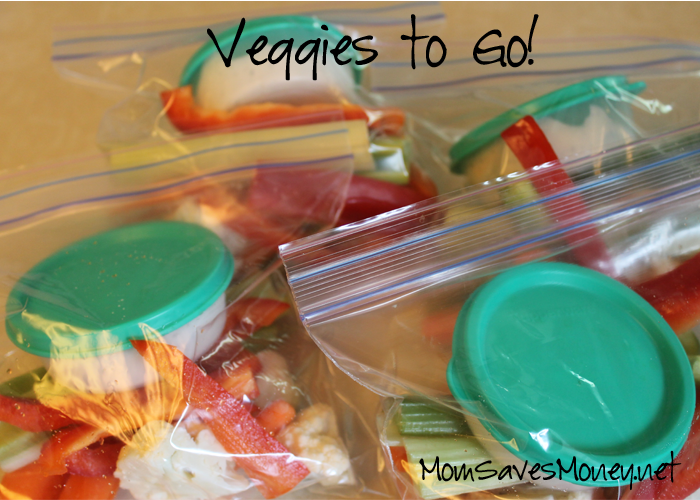 My 2-year-old eats most veggies, so I always have them on hand. For him. And I’m really good at serving them to him. Not me. But I do find that I eat more raw veggies when I take a few minutes to prep them. For me, that mean cutting up a bunch of vegetables and putting them into a 9×13 plastic container and sticking them right back in the fridge. Come meal time, I just put the whole container on the table. Everyone can help themselves. It also makes it much easier to cut up a few pieces and throw them in a salad. Or dice them for a soup or a casserole. Winner! Since I work outside of the home, I also like to take veggies to work to eat. So after I chop them, I put some into 4-5 different baggies. I’m a fan of dipping them in Ranch, so I also throw in a little Tupperware container of Ranch dressing. Stick them all in the fridge and then I can take one to work each day. No more excuses!